The cover image is by dylan harris. Typesetting by Meghan McNealy. 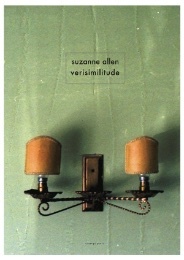 Verisimilitude is the debut pamphlet of Suzanne Allen, a regular on the Anglophone Parisian scene. Published by the equally Paris-based Corrupt Press, it is a modest-looking yet beautiful collection, with an evocative cover of a rundown interior. This poem perhaps best summarizes the pamphlet: a questioning of language and of status quo, through humour and heart. Verisimilitude is a collection of love, of loneliness, and the pursuit to palliate the latter through an exploration of language. Claire Trevien, Sabotage Reviews.